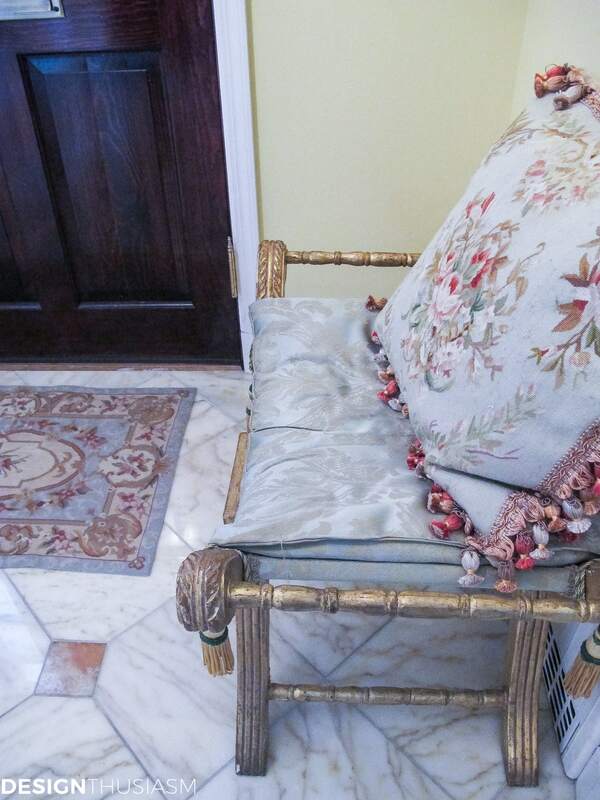 In this post: By utilizing creative foyer design, we were able to expand our tiny entryway without building out and completely transformed the entrance to our home. One of the biggest challenges in renovating our house was how to make the front entry welcoming. The original entry was a tiny space that then opened directly into the living room where the staircase to the second floor was located. You can see the old space below, which was so small, it was impossible to stand in it and get an accurate picture. We decided to open up the space by knocking down the small walls that connected it to the living room, tearing out the miniscule closet in the entry, and adding walls to separate the new expanded entry from the now reduced, but still large enough, living room. We also added a much larger closet to the new entry and used marble tile to separate the space from the adjacent room. There was now room in the new space for functional furniture including this antique bench. 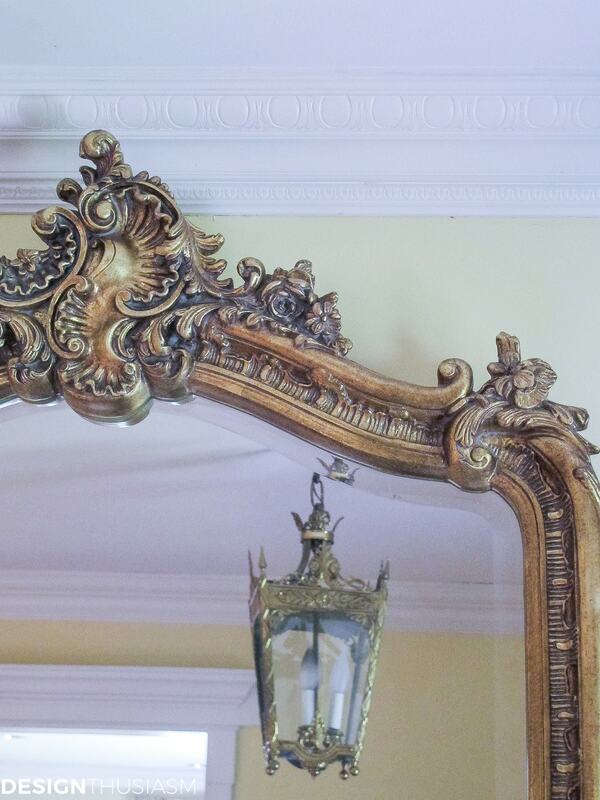 We added egg and dart molding to offer some character and a gilded mirror for both function and delight. 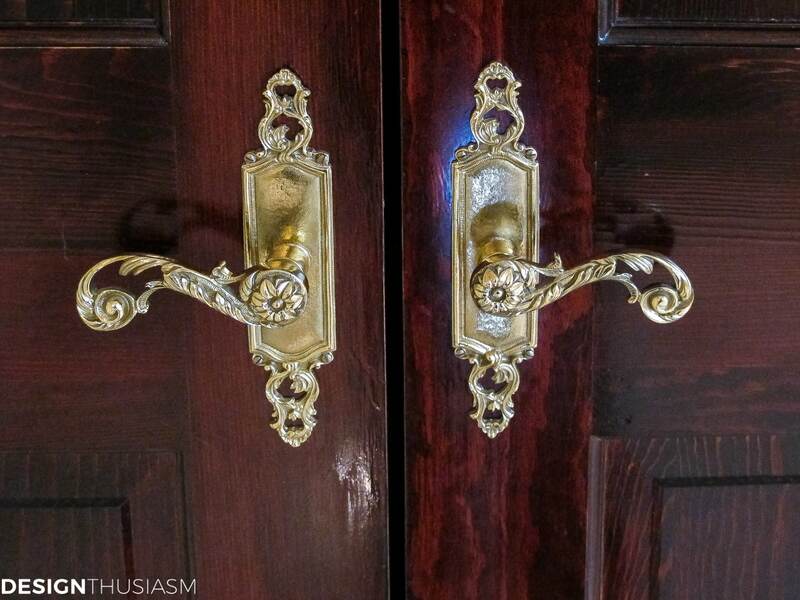 One of my favorite details is the closet hardware added to the new double doors. 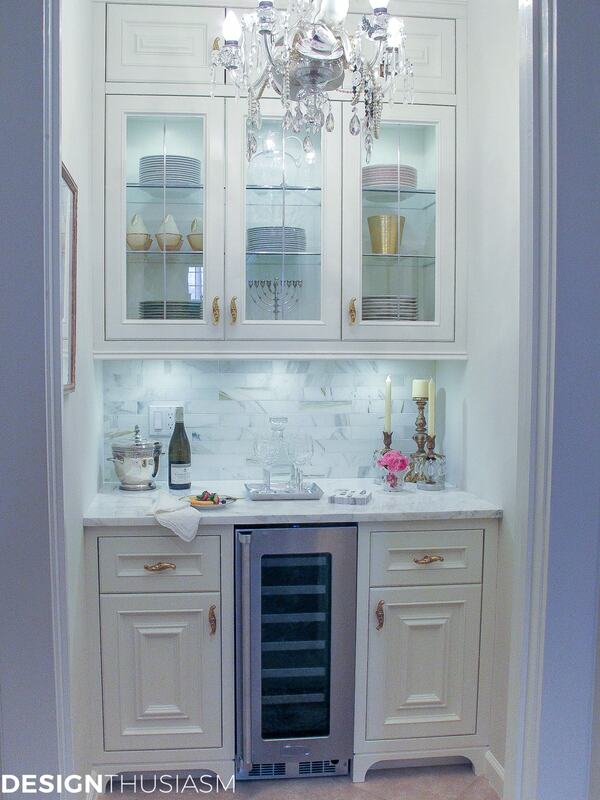 A painted white chest lends a space to store hats and gloves and is flanked by Rachel Ashwell’s Darcy chairs. 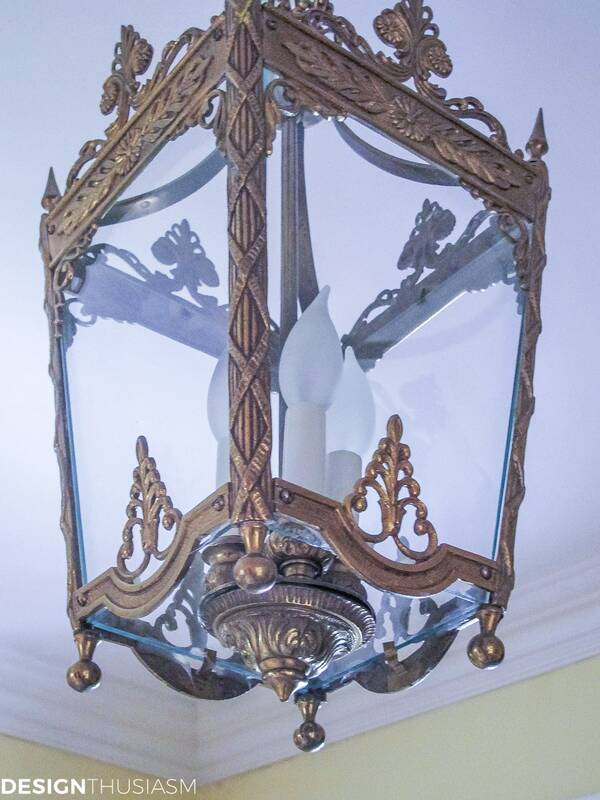 For lighting I found an antique lantern and had it rewired for functionality. Needlepoint rug and pillows pretty up the room, helping to make it welcoming. 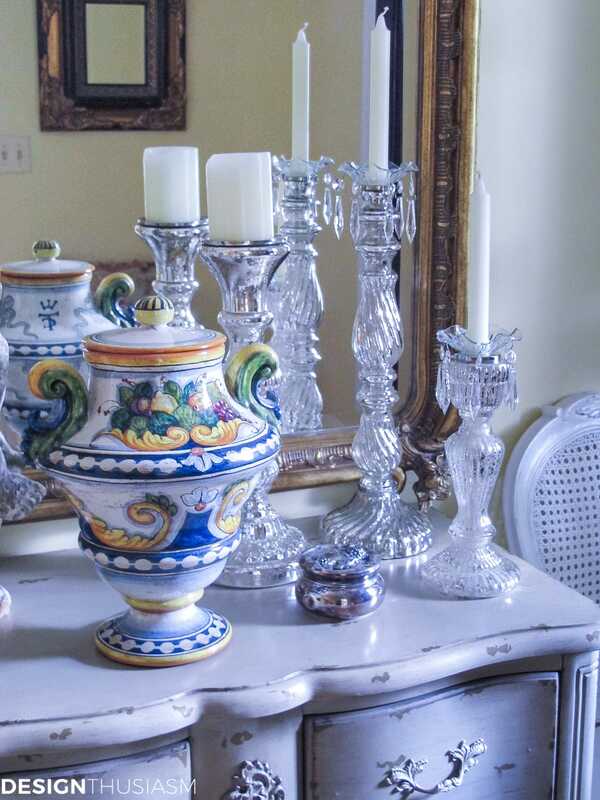 The bureau vignette includes an Italian pottery urn from a recent trip and mercury glass candlestick holders. 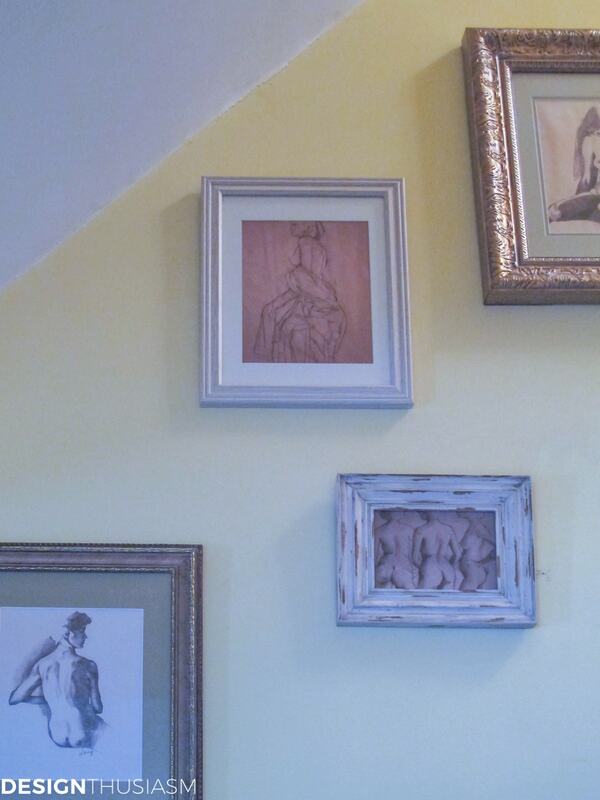 I lined the stairway with some of my old life drawings, one of the few places in our home where I’ve displayed my artwork. From the new entry one can glimpse the living room and through the mirror one can get a peek into the den. The final touch was a brand new banister, stained to match the new doors. Little changes make a big difference! I love the light chest now and the light floors with the dark wood accents~ your gallery wall takes me back to art school days~you have made the sketches elegant in this framed grouping~very inviting now! Yep, art school days indeed! I actually didn’t even bother framing the originals. In fact my intent was to print them on fine art paper, but I did the layout with xeroxes and wound up just using them… lol! Looks so beautiful! I love the mirror! Wow. Just…wow!!! Double wow, in fact! What a huge difference! Not only enlarging the space, but lightening it up the way you did. It’s gorgeous! 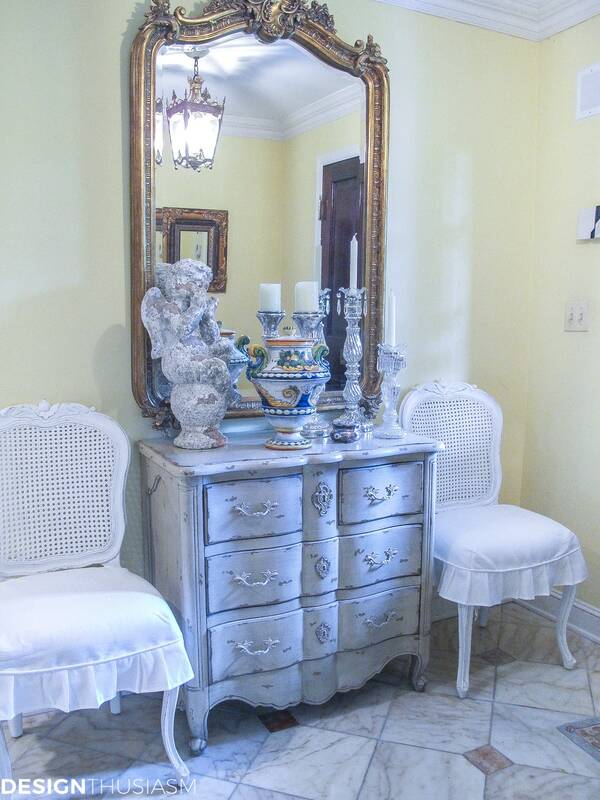 The furnishings and accessories are gorgeous! My cousin lives in a home with a tiny vestibule-like space like you had. I wonder if she’s ever considered getting rid of that in favor of opening it up? I’m going to send her a link to this post so that she can see the major difference it makes. The new banister looks terrific, and I love the stairs with those carpet rods!!! So elegant! I’ve been rallying for the same here. I just think it looks so cool with some of the stairs’ wood exposed. 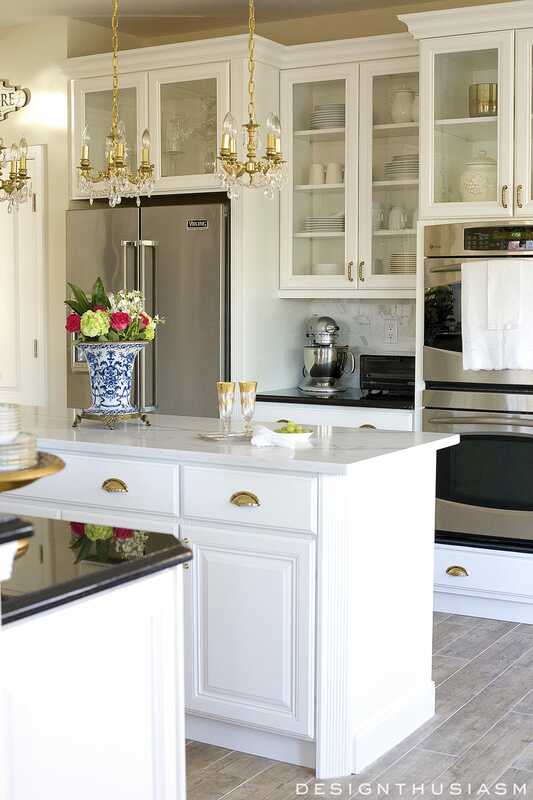 SO in love with the door hardware and that bureau with the pretty chairs flanking it!!!!!!!!! Thanks Alycia! I actually remember seeing someone post last week about a tiny vestibule, which is what reminded me to do this post. Was that you? Did you post somewhere about that? I actually have some older “before” pics from when we first moved in, which are really shocking, but didn’t have time to scan, but they do show the layout better. I highly recommend this type of change for your cousin, though. If she has the space in the adjoining room, it is so worth it. Our theory was, we weren’t using the part of the room by the staircase anyway. Thanks for the enthusiastic compliments!! WOW wow wow wow wow. This is an amazing transformation, holy moly I absolutely adore it. Your artwork is incredible, too – you have subtly highlighted it perfectly. 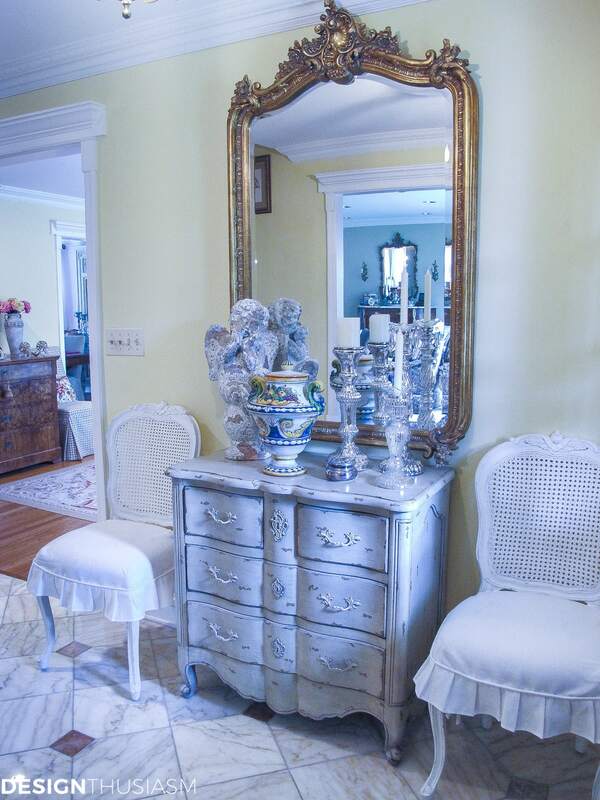 I love the antique bench and the painted chest. 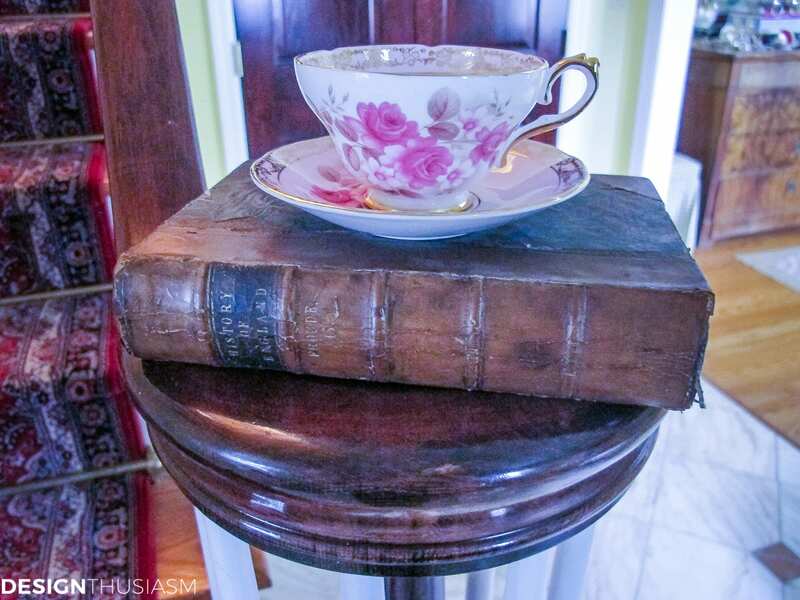 I love vintage and antique things, they’re so gorgeous. I think putting them all together is what make each piece stand out. I love it. 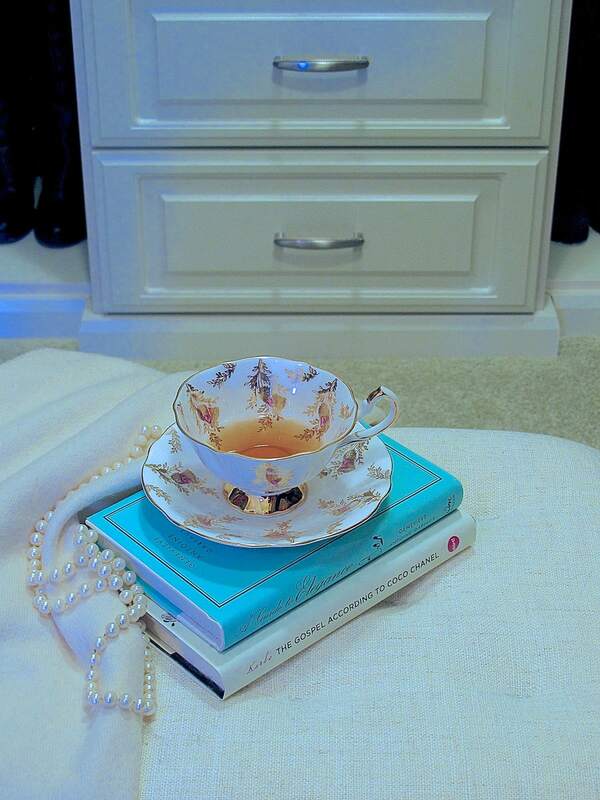 This is just so gorgeous and elegant. And that lantern…oh my goodness! Your art is beautiful! Oh wow, not that inspires me! I have been trying to talk the hubster into taking out the wall in ours…Seeing yours tells me I was right. It would look even bigger and brighter. Lory, this is just beautiful. 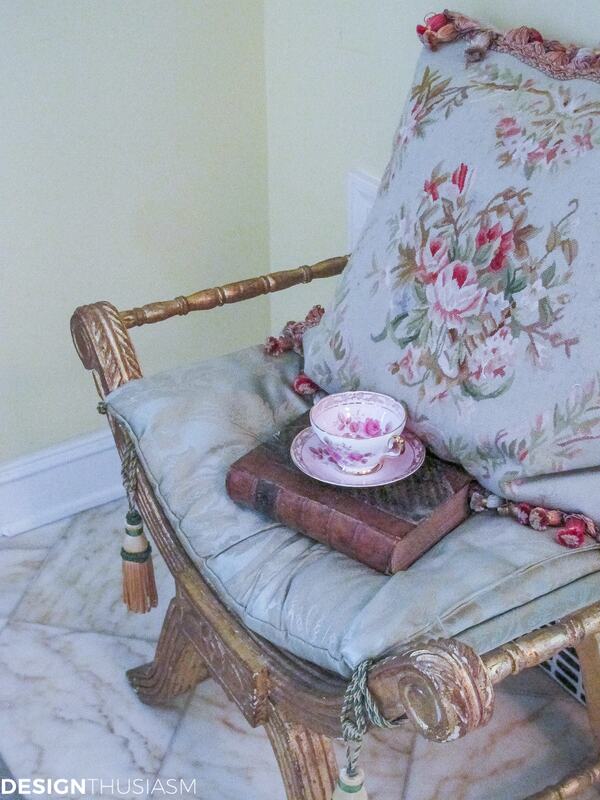 My grandmother had chairs with the roses similar to what is pictured in this post. She loved that look! Newest fan/follower here. Thanks so much, Sinea! Very much appreciated… 🙂 I actually have chairs in the living room that were my grandmothers. You’ll see those in a post soon. It is gorgeous! Knocking down those walls made a huge difference. I love everything you have done! What an amazing job you have done! Beautiful! I love that little white chest. I can’t wait till we move and I can redo things (again!) 🙂 It came out great and the colors and accessories go well together. It looks amazing! & I love your decor, mostly your artwork hanging. So beautifully elegant! All of your choices come together perfectly. Thanks so much Christy! Thanks for stopping by! 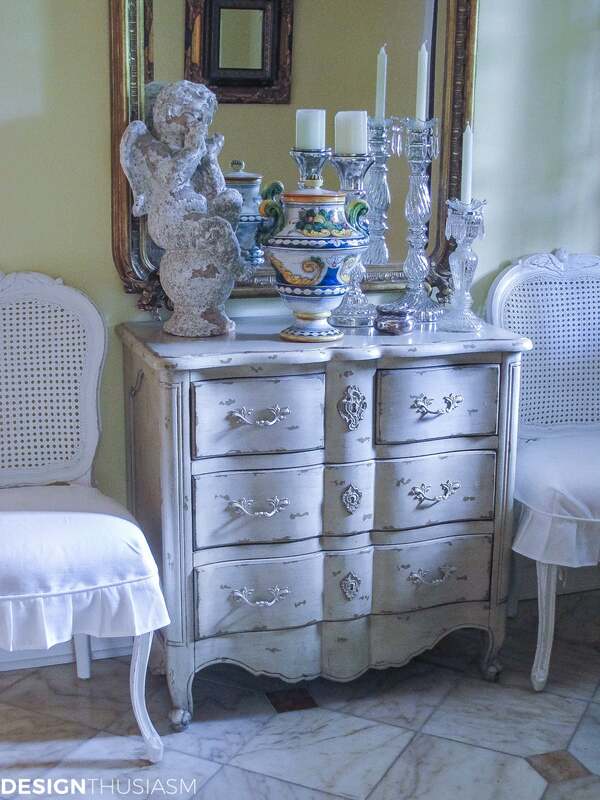 What a brilliant idea – and I’m in love with how you decorated it – the mirror – the dresser -and that chandelier – GORGEOUS !!! Thank you so much Vanessa!! Yes, I love the sunny feeling of a soft yellow… 🙂 Thanks for visiting! What a beautiful entry, Lory. That flooring is just gorgeous. My living room runs the entire width of my house, with the front door smack in the middle. Would love to have a separate entry. Thank you, Marilyn! Yes, having the tiny entry really drove me crazy. 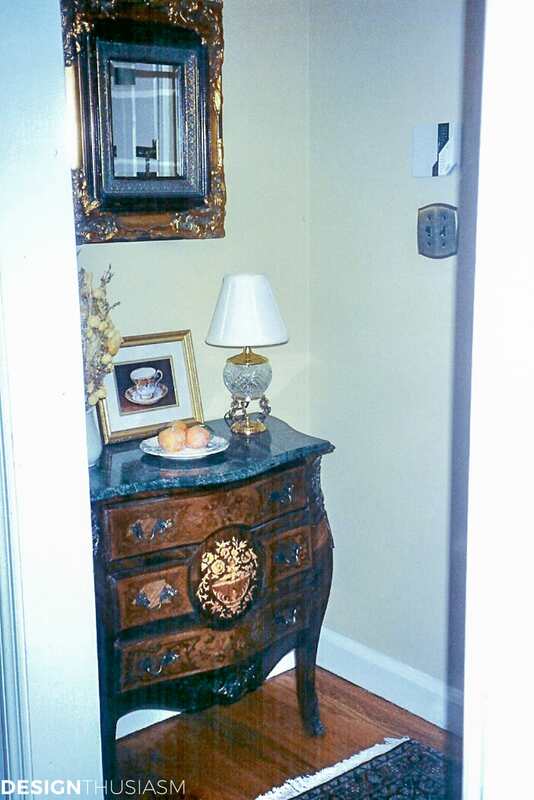 In your space, do you have your room divided on either side of the door, like with separate conversation areas? 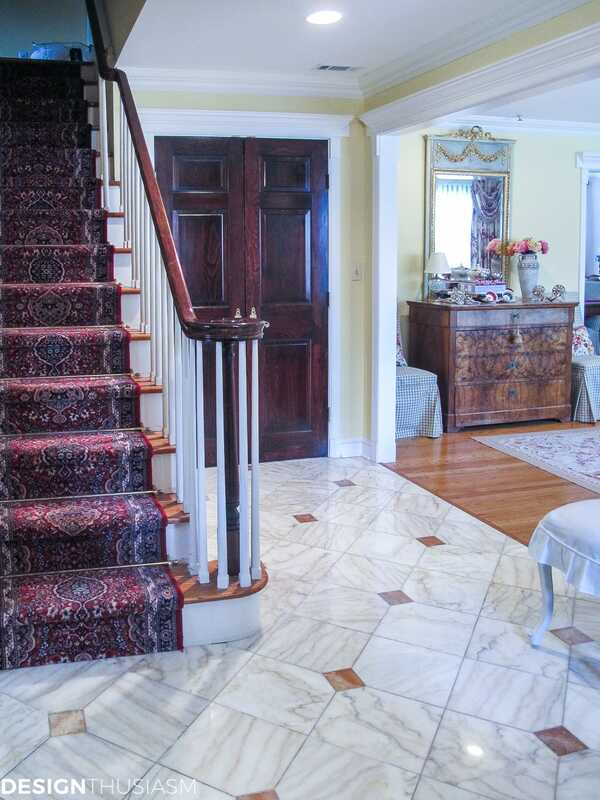 If so and the space is large enough, you may be able to decorate it so that it feels like an entry foyer.